There are a number of reasons for homeschooling. Many choose based on religious beliefs, while others are not satisfied with the level of education that is offered by the public school systems. Due to the decreases in funding, larger class sizes and insufficient teachers, education standards have decreased in the public school systems. Home school can provide a better education for students. According to a US Department of Education statistics report, nine in 10 homeschooled students’ parents reported that concern about schools’ environments was an important reason for their decision to homeschool. The number of homeschooled students increased from 850,000 students in 1999 to 1,773,000 students in 2012. 25% said the most important factor was a concern about the environment of other schools, such as safety, drugs, or negative peer pressure. The second most important factor (parents could only choose one) were for “other reasons” which included family time, finances, travel, and distance. 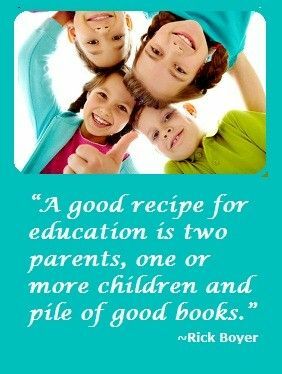 Instead of being concerned with standardized tests or class averages, parents as homeschool teachers can concentrate on what is important: giving your children the best education possible. Private schools are simply not an affordable for many parents and homeschooling can be affordable on almost any budget. Children with special needs and behavioral issues can be handled better in their home environment. In some cases there is a drop in behavioral issues. Religion is also another reason why some parents choose to home school their children. Public school does not offer religious instruction for individuals who want to instill those values unto their children as part of daily instruction. Many Christian parents believe that it is their responsibility to teach God’s Word daily, not occasionally, and more and more public school teachings are in direct contrast to Christian values. Convenience of being able to adjust schedules around work and being able to do the things you want to do with your family. It also works well for parents who are working from home or who travel for their jobs. Homeschooling allows parents to work their careers to the fullest while being able to educate their children and being able to travel when they need and want to. There are also instances where parents begin educating their gifted children earlier than the public education system allows children to enter. This gives parents the opportunity to challenge their children and maintain developmental levels. While there are definitely parents out there who cannot WAIT to get their kids into school and out of their hair, there are many who homeschool for the very opposite reason: they genuinely like spending time with their kids. They like getting to know them, learning with them and just being around them. 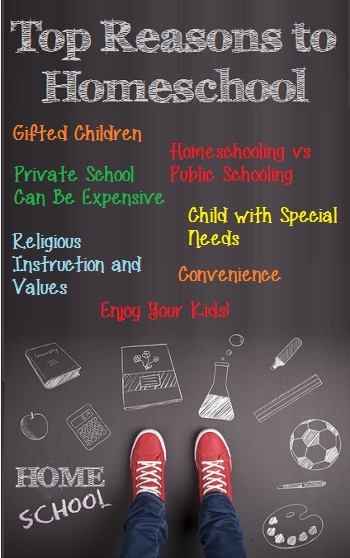 There are also a variety of other reasons for homeschooling children. There are a number of personal reasons as well outside of the general reasons why someone may choose to home school their children. The reasons may be based on family issues or the need to incorporate values and beliefs into the actual learning curriculum of the children. 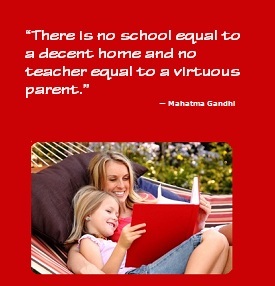 However, the majority of people who home school their children agree that one of the biggest reasons for homeschooling is the ability to offer their children a better and more complete education at home that is challenging and provides the flexibility to incorporate values and beliefs into the curriculum. Home school is a great way to educate your children and provide them with the tools they need to have a future in their chosen field. They are able to explore exactly what they have interest in. Education can form the basis that allows children to becoming active and well adjusted adults in society. As a result it is important to provide them with the best education possible and home schooling is one way to ensure that children can reach his or her full potential. My daughter is in 7th grade and we are researching our options to homoeschool. I read a story about a Mom who got arrested for homeschooling her kids. I am just worried about taking her out of school now and doing everything the correct way. What online program should I choose? What if she chooses to go back in high school? Where could I get these answers to my questions? This is a great question to ask. When you first start homeschooling, it is a good idea to reach out to your school district and ask what the state expectations are for your child. Each state in the United States has their own guidelines, so it’s important to familiarize yourself with their requirements. For more information, I suggest you check out several of our blog posts. Let us know if you have any more questions, and thank you for reaching out! If you are afraid, we are all afraid to homeschool the first time. It is a huge leap of faith! My family decided to give it a try for a year and we never stopped. If you are afraid of the police, get a membership with the HSLDA. They give you a 1-800 number to call if the police show up at your door. My granddaughter is nine, we considered homeschool before she entered public school but her father was adamet about her going for socialization. When tested for kindergarten she scored the highest of all the children tested. I was concerned because she came home bored everyday ( she still does). Socially she has difficulty making friends. She’s a happy girl, very loving and caring but doesn’t do well with peers she feels bullied and is teased because she does well academically. I’m at a crossroad about educating her at home. We travel a lot as well and I’ve taken her out of school to join us, but it gets more difficult each year. My main concern is, if I homeschool (which she’s been asking for the past two years) will she benefit and if it turns out it wasn’t the best idea is the acclimating back difficult or detrimental? Guess I’m just very concerned about hurting her academic path. Great question! You raise a lot of concerns that are common to people considering homeschooling. 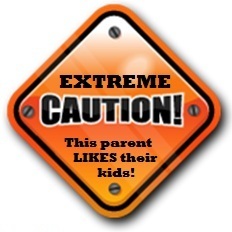 Many of yours are dependent on how others will react to your daughter being homeschooled. Specifically, her father and the school district sound like the ones with the most impact. I suggest calling her school and discussing the situation and your desire to try homeschooling. They will be able to tell you how they feel about homeschooled children returning to school if things don’t work out. It really should be no different than changing schools; the “new” school may have taught some things that the “old” school had not yet covered and vice-versa. As long as you are diligent about helping your daughter learn, you should be able to at least keep on par with what is happening in school. In my experience, you will surpass it. Her father’s concern about socialization is important because of his role. There are two parts to handling this. The first is to fully understand his specific concerns. Is it that she won’t be around other kids or is it that she needs to work through the peer pressure or is there something else that makes socialization important to him? The second part is to talk through alternative ways to handle it that are acceptable to him. These could be in the form of joining a homeschool cooperative where she’d be around other children, getting into activities specific to her interest areas that have other kids involved, or by encouraging play dates with her closest friends. If you look into postings about homeschooling and socialization, you’ll see homeschoolers aren’t concerned about it. They are too busy with all of the activities they are doing. My daughter does not want to go back to her high school this fall. I am concerned about schooling at home but I am open to it. Any suggestions on finding the right curriculum? She has mentioned wanting to repeat her freshman year. Can you do this? Any suggestions would be appreciated. Thank you for reaching out. Here’s what you need to do. First, call your school and ask them what the options and requirements are in your area. They may have some interesting programs that could fit what your daughter is trying to do. They’ll also tell you the legal requirements. Please be sure to follow them, submit paper documentation, and keep copies of anything you send. You want to consider the value of an accredited curriculum. 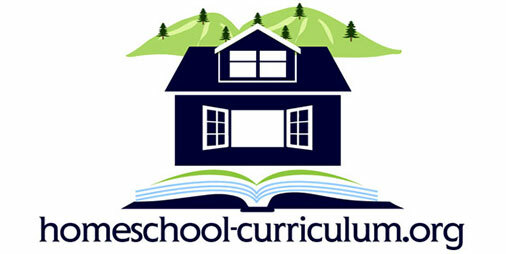 There’s a short article about it here: http://homeschool-curriculum.org/accredited-homeschool-curriculum/. You may also want to consider online high school courses. There’s an infographic about this here: http://homeschool-curriculum.org/online-homeschool-high-school-courses/. Check out what your local community (or even full-time) college offers for homeschoolers. Most community colleges will accept people over a minimum age and many colleges offer special programs for homeschool children. Lastly, I’ll be announcing a fall homeschool session in the next few weeks. You can subscribe to receive notifications by taking the homeschool style quiz on this site. Please let me know what other questions you have! One of the main reasons I am considering home schooling my daughter Anastasya is definitely because she is very gifted and just like it said above she is pretty much falling backwards and waiting for her peers to catch up with her. It is very sad to see. Also, because of her unique and philosophical way of thinking Anastasya doesn’t fit in or have any friends and detests school. We also travel a lot. Do you think I should homeschool her? I am leaning on the homeschooling side, but what’s your opinion in this situation? We travel a lot as well and found homeschooling to be our only viable option. While non-homeschoolers generally worry about homeschoolers’ socialization and homeschoolers generally don’t worry about socialization, I do. One of my goals is for our son to have as much play time and being with others as possible (he’s seven). I don’t know your daughter’s age, but you can absolutely provide the education she needs at her level through homeschooling. She may even pick up a friend or two once you match her to learning that fits her interests! I’m holding a free online workshop about starting homeschooling on June 15th. I’ll be sure to notify you of the details as soon as I have the technology set up. My daughter refuses to return to school to finish out 6 weeks of her Jr year. Is there any way to home school to finish out the year? It sounds like a difficult situation. Without knowing your circumstances, the first step I suggest is to contact your school district to see what they may have available with so little time remaining. Making a quick switch like this may be even more painful than completing the school year with possible impacts to transcripts that can affect senior year and graduation. You’re probably looking for any solution that could work, but homeschooling isn’t a quick fix in high school years. If you’re committed to investigating further, here are my recommendations for the short term: 1. Take a look at virtual schools where she can meet the end of year requirements. Depending on her future direction, you may want an accredited program. 2. Check out local community colleges to see what may be available. 3. Ask your daughter how she sees herself completing her schooling – if she’s college bound, the disruption can impact grades. If she’s not, is she okay with determining her own graduation (maybe a GED)? In the longer term, there are a ton of options for alternatives to regular public school available. If she can make it through Junior year, you’ll have these six weeks and the summer to find one that fits nicely with what she wants. If you want to share a little more, please reply to this post!